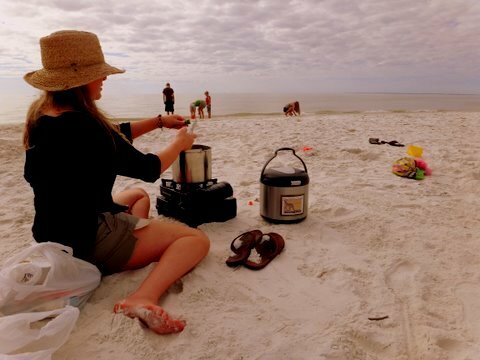 Our friends, the manufacturers of Saratoga Jacks Thermal Cookers, actually used this 8 Day Menu Plan while traveling around the Gulf of Mexico while testing the thermal cooker. It was a great lesson on how to create mobile kitchen which is valuable for cutting travel expenses. A simple mobile kitchen is also great in case of the need to bug out. Breakfast: Eat anything in your fridge that will go bad while traveling. Pack healthy snacks like fruit and nuts for the road. Start dinner dinner in the thermal cooker. Dinner: Hawaiian Haystacks (Rice on bottom- Chicken In Chicken Gravy on top). Toppings of green onions, green peppers, pineapple, chinese noodles, chopped celery, shredded cheese in ziplocks in the cooler. Breakfast: Omelets in a bag. Start the Bacon and Potato Soup for dinner in the boiling water you used for the omelets. Dinner: Two packages of the Creamy Potato Bear Creek Soup Mixes. Use the left over real bacon bits, chopped up vegetables and cheese that you used for breakfast. Add a can of drained corn, and a pinch of curry powder. Serve with a loaf of french bread or a bag of rolls previously picked up from a store while we are traveling. Breakfast: I started this at midnight the night before which we ate between 7 & 8 a.m. I made Hot MultiGrain Cereal (Steel Cut Oats with a little Barley and Chia seed). 5 cups of the mix to 8 cups of water in the bottom pan. Hot Peaches on Top. I sprinkled with nuts and raisins when served. Clean out the pots and start dinner. Dinner: We had Teriyaki Chicken which I started in the bottom pan with rice in the top pan. Breakfast: Omelets in a bag. Start Chili for dinner. Dinner: I use the whole big pot due to the size of my family. Set the little pot aside. Later if I have my cheap portable oven, that folds flat for travel with me, I might make a corn bread mix. I put it in the empty small pan and bake it in the mini oven as it rests on my butane stove. I serve that with the chili. If I am at home and the sun is out I would make the corn bread in my solar oven. If I don’t have the portable oven or sun oven, and I am on the road traveling, I will buy rolls. Breakfast: Fresh Fruit. Finish preparing the dinner. Dinner: Drain water in the morning. Pull apart the roast into pieces and put in the bottom of the big pot. Cover the roast in a slightly watered down BBQ sauce (I like Sweet Baby Rays) and bring it back to a boil for Two Minutes. Durint the third minute of the boil add a 1/2 cup of Ultra Gel in a BBQ rue. Mix it in good…Place it in the thermal cooker, shutting the lid quickly. In the small upper pot I do my favorite pork and beans recipe. Buy a package of salad, and some hamburger buns for dinner. Breakfast: Omelets in a bag. Start dinner. Dinner: Beef Stew in the bottom pot and Instant mashed potatos in the top pot. Breakfast: Fruit and Granola for Breakfast. Start dinner. Dinner: Sloppy Joes! The sauce will be in the bottom pot. Brown the hamburger in the bottom of the large pot, drain greese, add tomato sauce and spices, boil for two minutes. Buy a package of hamburger buns and a watermelon. Mixed vegetables in the small top pot, boiled. Breakfast: Omelets in a bag boiled in the large pot filled about 1/3 with boiling water. Use the water to make 1 package of Bear Creeks Cheesy Broccoli Soup. Add to the soup all your left over vegetables. Add a whole head of cut up broccoli. This should fill half the pot. In the top pot make Cheesy Au Gratin Potatoes.